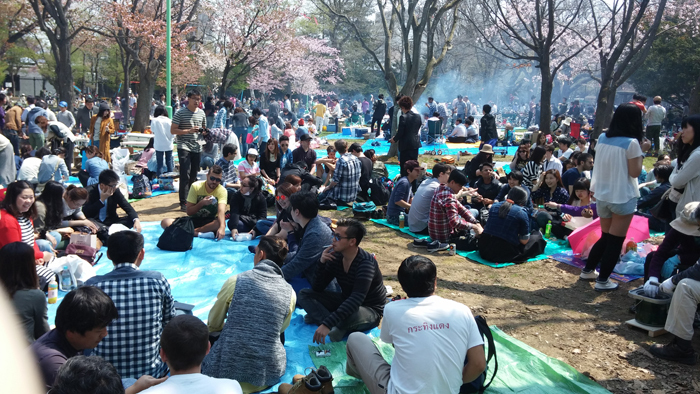 Yesterday, Me and my school went to the Hanami(Viewing of Sakura flowers) party, It was interesting, but the heat was unbearable. Everyonne was having fun with barbeque, general chit chat and some people even played some gaes. But my group's people drank a lot of alcohol. Maybe we even drank a little too much. Teacher's also came to the party and they even gave my group more alcohol, amazing, Thank you so much! It was very fun drinking so much alcohol and so many different kinds that I'd never have before, but they were nice. After the hanami, I went with a large new group to go Karaoke. It was a long road, all the way from Maruyama Park to Susukino. 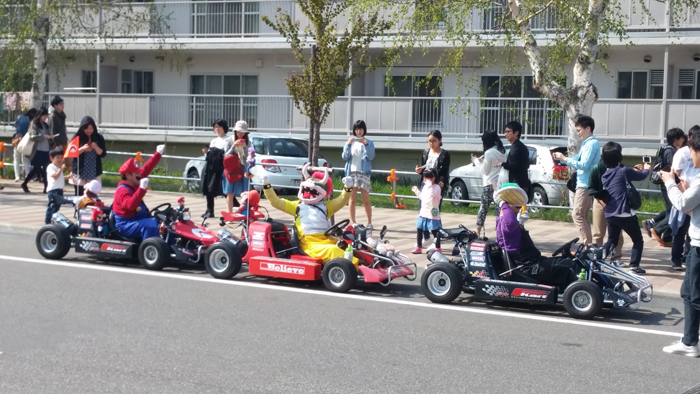 But as we exited the park we met characters from Mario Kart. You guys like Mario Kart? We took a lot of pictures and then went on an adventure with the subway. Always interesting, lol. At Susukino we met more people and went together to the Karaoke. Everyone was very good at singing, but especially the teacher was good! At the Karaoke, we drank a lot more alcohol, but I didn't get drunk, thankfully. A good three hours later, some of us went to eat Ramen, which was ok, but a good time. But then we went home. Can't be helped. But it was fun. Hello! My name is Michael, and welcome to my blog~. I have never written a blog before, yet alone in Japanese, mostly because I am not yet fluent. So this is a new experience for me. It was a year ago that I came to Japan, It's still unreal and surprising to me. These days though, it seems to be getting warmer. I am the odd one not liking heat, mostly because I am a northern Swede. I want cold weather, and it is nice here in the winter. I'll be waiting. This week the spring holiday ended and I finally started the second year of the school. We are studying a lot of new grammar and things, but I am already done with the kanji homework, yay for me. I also wrote an essay, and I like that. Tommorow, the new years first week of school is over. Time flies by too fast here. In the future, I wonder if I will write more blog posts, let's wait and see.